April is one of my favorite months because Spring is here, the grass is green, flowers are blooming and we have Earth Day! April is always a great reminder that our Earth is beautiful and it takes effort on our parts to keep it that way! Today, we have some great tips on being earth friendly from Dr. Sharp Natural Oral Care, one of our new favorite toothpastes! Dr. Sharp Natural Oral Care is a line of natural oral care products that were created by a fourth-generation dentist. All products are made from natural, safe ingredients, and are made in the USA. The product line includes toothpaste for children and adults, mouthwash, and dental tape. All products are safe to use, made in the USA, and are gluten-free, have no artificial colors or flavors, are vegan, non-GMO, alcohol free, fluoride-free, and cruelty-free. Plus, they help whiten teeth and have xylitol, which is a natural sweetener that also helps to fight off cavities. The products are safe for the entire family. I love their natural toothpastes that don't contain fluoride or SLS! Plus, they make a tasty, fun toothpaste for children which is also safe and natural for their little bodies! Not only do they offer natural toothpaste but he runs an eco-friendly business! In his eco-friendly business, they have also taken measures to ensure that all of their products are vegan, not tested on animals, all of the tubes and bottles are BPA-free, that all of the packaging and components are recyclable, and that their toothpaste boxes are printed using soy ink. A company serious about sustainability and being eco-friendly, they have taken measures at all corners to make their products as earth friendly as possible. · Look for ways to opt for energy efficient upgrades. This includes any appliances, heat and cooling, etc. An old air conditioner, for example, is going to take a lot more energy to keep the office cool than a newer energy efficient model. While some m ay shy away from the initial expense, it can save the company money in the long run because the new unit will save money each month. · Consider the paper situation in the office. Go paperless as much as possible, use both sides of each sheet, reduce the margins so more fits on a page, and purchase paper that has been made with post-consumer recycled materials. ·Purchase products that are made from recycled materials as often as possible. Today’s office supply stores offer many options, including recycled paper, envelopes, ink pens, and more. The only way the recycling efforts work is if there is a buyer for products made out of the recycled materials, so be a part of that process. · If your company makes a product or offers a service, evaluate how environmentally friendly it is and see where changes can be made. Perhaps there are packaging or ingredient changes that can be made that keep the integrity of the product, buy that are better on the planet. · Opt for green marketing, which includes reviewing the packaging for any shipping being done. Consider labels, inks being used in the printing process, and looking for ways that help reduce putting things out that people won’t use. For example, there are hundreds of little plastic gadgets that you can buy with your company name on them to hand out to people. However, most never use them and they end up in landfills, where they will sit forever because the plastic doesn’t biodegrade. When purchasing business cards, marketing materials, and fun products to promote your business, opt for those that are environmentally friendly. · If your office is not already recycling, make it an office-wide commitment. Contact your local recycling center to see what the process is for having the items pi cked up each week. Be sure to also have your old electronics and fluorescent light bulbs recycled. · Take a look around the corporate kitchen and ditch any disposables that are not eco friendly. Things like Styrofoam and plastic sit in landfills, rather than decomposing. Replace them with reusable or the environmentally friendly options that you can buy in bulk online (they are made out of corn and are biodegradable). · If you have many employees who are commuting to work, create a carpool group that will encourage people to ride together. 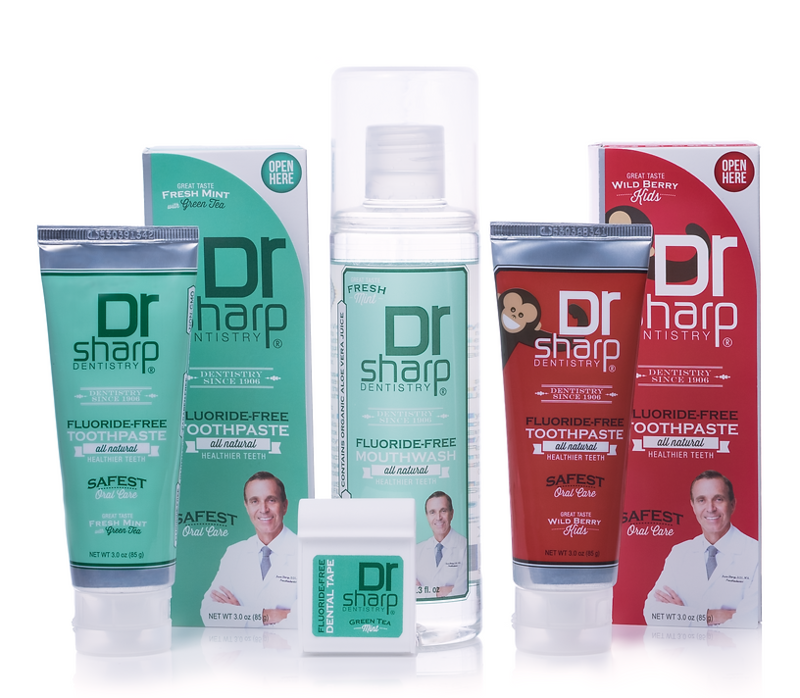 You can purchase Dr. Sharp Natural Oral Care products from their online shop.